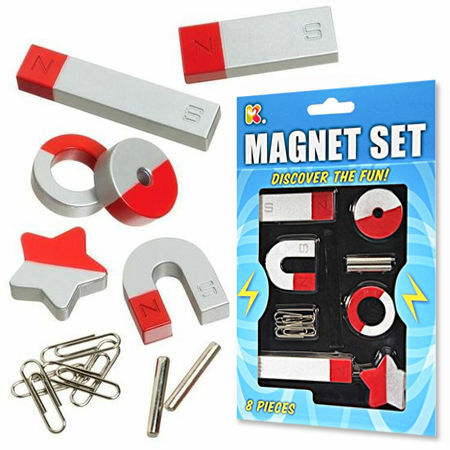 Magnet Set Eight Piece is a brilliant set of magnets and accessories. Magnets are a fantastic exploring science toy as you see what sort of things are attracted. You can do all sorts of experiments and work out what can be picked up and what can't. These magnets are marked with North and South Pole. Every magnet has at least 2 poles. Opposite poles attract or pull together. Like poles repel and push apart. We like this because: "Fasinating and fun ."